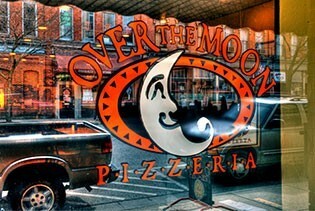 ﻿ Over The Moon Pub & Pizzeria - Ohio. Find It Here. HOT PIZZA! COLD BEER! GOOD TIMES! We are Over the Moon Pub & Pizza...local folks making great pizza, subs, salads, and wings at 170 Front Street in historic downtown Marietta, Ohio. For live music, a full bar, a fabulous banquet and party room, pizza on the patio, free off-street parking it's Over the Moon Pub and Pizza!Pizza has become a food group in America; it goes good with a soda or a beer.In addition to a full line of Pepsi products, we are pleased to be able to offer a full bar with draft and bottled beer, great house wines from Italy, and mixed drinks as well.